In this interview from 1988 Isaac Asimov envisioned already Personal Learning Environments, although he did not call them as such. The trailer was made in cooperation with the Sound and Vision department of the Open University. Produced by Alba Madriz in cooperation with Studio 43. After three years of MUPPLE workshops and one special issue, the state of the art in Mash-Up Personal Learning Environments will be available as a video lecture series and – subsequently – in a textbook (Editors Fridolin Wild, Matthias Palmer, and Marco Kalz). 26/04/2011 – Matthias Palmer: Widget Communication using partial semantic interoperability; Mapping the MUPPLE features of web based systems (double lecture). 03/05/2011 – Ivan Zuzak: Interwidget communication. 10/05/2011 – Scott Wilson: Widgets and Mashups for Personal and Institutional Technologies. 17/05/2011 – Fridolin Wild: Learning an ecosystem: networks, mash-ups, analytics. Each lecture serie will be recorded and will be available after the event. Further information about when and where to see the series will be announced in this group. 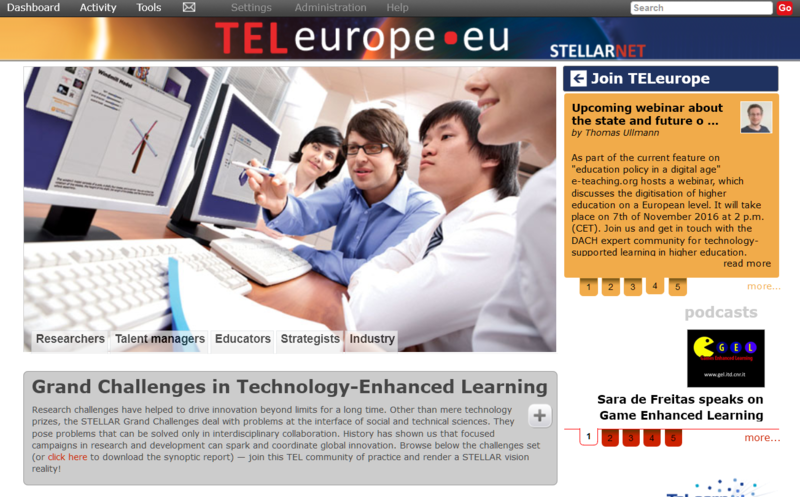 During my work for the FP7 Network of Excellence STELLAR, I have been working on the social networking platform TELeurope. TELeurope is based on the open source software Elgg. The landing page got a complete face lift. We added a FlashVlog, which will update you with information from the leading members of STELLARNET. We especiall addressed five stakeholder groups and will provide information bundles for quick access to relevant information. The podcast widget on the front page shows you the latests podcasts from the TEL experts. The “What is hot in TEL” area surves the purpose to show all members on the first page what the most important contents, opportunities, events, etc. are. Help is at your hand: The topbar contains now a link to a help page. This will give you quick access to all relevant pages and groups to find support on TELeurope. Login/Register page: The login and register form is now included into a drop down menu on top of every page of TELeurope. The landing page can now include Elgg native widgets and the widgets coming from the Wookie Widget server, enabling a high degree of customization. Spam Security: To prevent spammers we implemented now a promising solution, which will minimize the acitity of spammers. As with the old version, every new user will be approved by a TELeurope admin. To make it easier for the admins to judge about the credibility of a user, the users have to fill out a shot description about themselves. Latest Elgg version: This release uses the latest version of Elgg (1.7.7). It includes several bug fixes and security enhancements. Enhanced permission system: The write and read access level can now be set tailored to groups. This means that you can write a blog post, which will only be seen by members of the group. An interesting use case could be the following. A user let call him STELLAR can pre-structure pages for the TELeurope members and grant write access to a group called “STELLAR faciliators”. This means that all members of the group can help to bootstrap pages for example for the Alpine-Rendes-Vouz, the help pages, the benefits of TELeurope page, etc. Enhanced Profiles: Now it is possible to add further fields to the profile page. More to come soon on how to make the most out of your profile. Messaging protection: By now every member of TELeurope could write an email to every other user. Now it is possible to restrict the messaging capability only to members, which are friends of you. Like feature of the river activity: Activities on the river include now a facebook-like Like feature. Rating of content: Content can now be rated by the members on a 5 scale rating skala. Enhanced Groups: Groups have now a group blog and you can share bookmarks with the group members. Additionally you can now integrate your RSS feeds into groups. See the VisiTELf plugin description below. And finally you can see all members of the group. Wookiewidgets: The wookie widget plugin was completely redesigned. You can now scroll through the availalbe widgets or simple use the mouse wheel. It will show the description of the widget. It uses also now the latest features of the wookie connector framework. With this our widget server was updated to the latest version. Eventspace: The eventspace takes the widget idea a bit further and allows now to show the widgets on a larger space. This will allow the members of TELeurope to personalize a space for their needs for exampe to write collaboratively a paper or to follow a video conference. VisiTELf: The latest version of the VisiTELf plugin comes with enhanced RSS feed options and visualizations of you feeds. More about this will be introduced by the developer later. Add this: Sharing on facebook and twitter an Co made easy. Check out the social sharing features on the the left. Branding: For a strong corporate design of all our STELLAR products, the branding uses now the STELLARNET look and feel. It has now the “Funded by the European Comission” and the the “powerd by STELLARNET” images on every page. Erik Duval, Thomas Daniel Ullmann, Fridolin Wild, Stefanie Lindstaedt & Peter Scott (eds. ): Proceedings of the 2nd International Workshop on Re- search 2.0. At the 5th European Conference on Technology Enhanced Learn- ing: Sustaining TEL. Barcelona, Spain, September 28, 2010, CEUR-WS.org/Vol- 675, ISSN 1613-0073. As concluded during the workshop, at least four challenges are vital for future research. The first area is concerned with availability of data. Access to sanitized data and conventions on how to describe publication-related metadata provided from divergent sources are enablers for researchers to develop new views on their publications and their research area. Additional, social media data gain more and more attention. Reaching a widespread agreement about this for the field of technology-enhanced learning would be already a major step, but it is also important to focus on the next steps: what are success-critical added values driving uptake in the research community as a whole? The second area of challenges is seen in Research 2.0 practices. As technology-enhanced learning is a multidisciplinary field, practices developed in one area could be valuable for others. To extract the essence of successful multidisciplinary Research 2.0 practice though, multidimensional and longitudinal empirical work is needed. It is also an open question, if we should support practice by fostering the usage of existing tools or the development of new tools, which follow Research 2.0 principles. What makes a practice sustainable? What are the driving factors? The third challenge deals with impact. What are criteria of impact for research results (and other research artefacts) published on the Web? How can this be related to the publishing world appearing in print? Is a link equal to a citation or a download equal to a subscription? Can we develop a Research 2.0 specific position on impact measurement? This includes questions of authority, quality and re-evaluation of quality, and trust. The tension between openness and privacy spans the fourth challenge. The functionality of mash-ups often relies on the use of third-party services. What happens with the data, if this source is no longer available? What about hidden exchange of data among backend services? 13h40-14h05: Fridolin Wild and Thomas D. Ullmann. The afterlife of ‘living deliverables’: angels or zombies? The presentation should not be longer than 15 minutes. Each presentation follows 10 minutes of discussion. This gives every slot 25 minutes. collect reactions through social media on the workshop. To get you started see the short notice “First steps for the Research 2.0 workshop” in the “Group page” section at the bottom of this page. The submission deadline for the workshop papers is extended! Within the STELLAR project, we provide the possibility to use living documents for the collaborative writing work on deliverables. Compared to ‘normal‘ deliverables, ‘living’ deliverables come into existence much earlier than their delivery deadline and are expected to ‘live on’ after their official delivery to the European Commission. They are expected to foster collaboration. Within this contribution we investigate, how these deliverables have been used over the first 16 months of the project. We therefore propose a set of new analysis methods facilitating social network analysis on publicly available revision history data. With this instrumentarium, we critically look at whether the living deliverables have been successfully used for collaboration and whether their ‘afterlife’ beyond the contractual deadline had turned them into ‘zombies’ (still visible, but no or little live editing activities). The results show that the observed deliverables show signs of life, but often in connection with a topical change and in conjunction with changes in the pattern of collaboration. MUPPLE II is your learning companion in the web. It supports you in learning new best practices from all the others out there – new practices in how to use tools for learning effectively. More precisely, MUPPLE II helps you to trace and replay usage strategies on the web. As a learner, you learn how to work with all the cool new tools on the web – without loosing endless hours exploring their ‘potential’. As a more knowledgeable other, you give your fellow peers a guide at hand that brings them up to speed – without you bothering to explain the thing over and over again. MUPPLE II is of course built as a Firefox Jetpack. MUPPLE is short for ‘mash-up personal learning environment’. The following page will show you all the things you need to get started and mupple the web (and a bit more). 1) MUPPLE II is designed as Firefox Jetpack. Because it’s cool, it is for free and open source. If you have not already switched to the ‘world’s best browser’, download it from http://www.mozilla-europe.org/en/firefox/ (recommended version: 3.6 and higher). 2) MUPPLE II runs on Jetpack. Get your own Jetpack at https://addons.mozilla.org/en-US/firefox/addon/12025 (version 0.8.1). 3) You are one-step away from your first MUPPLE II experience. Get the latest version at https://github.com/Laurian/MUPPLE (see download zip button in right hand column). You are now ready to trace and replay the web! Wouldn’t it be great to have a recorder at hand that helps you trace click stream in your web app use, recording all necessary steps that you have to walk through if you want to, for example, write a paper collaboratively? Wouldn’t it be great, if you can share this trail with someone else – without requiring you to guide them step by step? Wouldn’t it be great, if you get guidance of how to write collaborative a paper simply by following in the boot steps of someone else? With MUPPLE II it’s easy to do all of this. In the following section, I will show you how you can turn your browser into a recorder of activities – and how you can replay them. Record the web: The recording and replay cockpit of MUPPLE II is realized as a slidebar on the left side of the browser window. Click on the MUPPLE icon and the slidebar opens. The slidebar section is divided into two areas. The first area contains all recorded activities (see ‘Open Workflows’). Click on one of the activities. In the second area below, you will see all the action steps needed to fulfill your activity, guiding you through the web. Click on one of the actions and MUPPLE II will show you in the main browser window to the right what you need to do to get things done. Don’t forget: MUPPLE II is not meant to automate things for you (you would use a script for that). MUPPLE II is designed to teach you usage strategies for those things that are too complex to get automated (such as writing a paper collaboratively). To record an activity you create a new activity. Navigate in the main browser window to the url on which the new activity is supposed to start. MUPPLE will log this. To log further action steps while interacting with the page, you simply right click on the relevant item and add it to the actions via the context menu. The new action immediately appears in the slidebar. Step by step you log all the required actions (and maybe some optional ones). In the next section, we will go a bit more into the details of recording the web with MUPPLE II. Further down the text you find a demo video of MUPPLE II showing all features in detail. ‘Please note that in the current prototype, the ‘Open Workflows’ and the ‘steps list’ are non-functional, that is that the prototype shows one single (default) workflow.’ Also MUPPLE won’t force you open new or switch tabs for now. The following picture shows how you can record a link ‘FM technologies’. It is one step of the activity ‘collaborative paper writing’, which we defined by clicking on ‘new activity’ in the slidebar. To record a link make a right click over the link (1) and select in the context menu the entry ‘add link action’. The slidebar shows as action step of the activity the newly added link (3). With MUPPLE II you can define besides the ‘add link action’, ‘add note action’, and ‘add form field action’. The link action records the selected link, while the note action adds selected text and the form filed action saves text fields, button clicks, and check-box and radio-box selections. These are the basic elements, you need, to record all actions of an activity. MUPPLE II is all about recording, replaying, and sharing activities on the web. Have you ever had the problem that you wanted to do something on the web and record this activity so that you can later on replay it and maybe to share it with your peers? With MUPPLE II, you just can share traces of your best practices with others. They will then be able to follow in your ‘foot steps’ on the web. In this tutorial, we will show you the basic of how to record the web. We use a simple activity that will get you going for scenarios that are more complex. 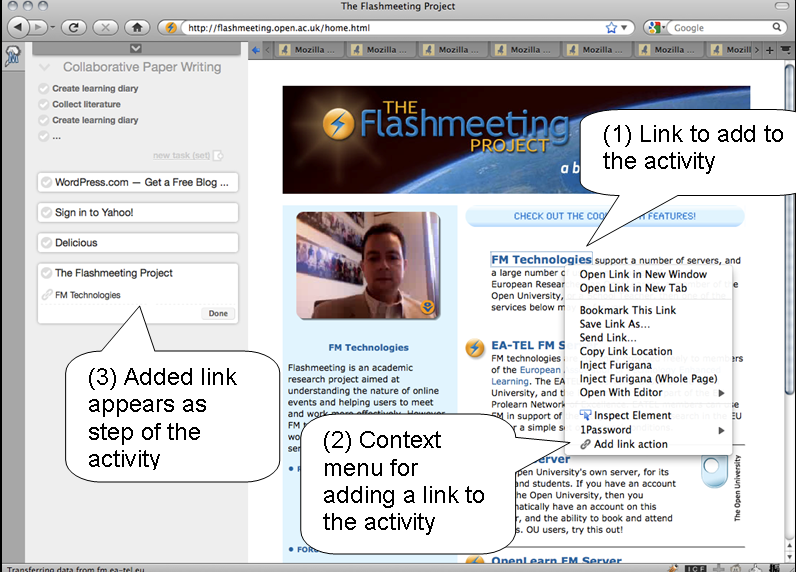 In our scenario, we want to record ‘booking an online video conference’ with FlashMeeting. We will show you how you can record this activity using the basic recording elements ‘add link action’, ‘add form action’, and ‘add note action’. With these basic actions, you can already record your activity ‘book an online video conference’. You then can share the activity with your friends, who can replay your activity. 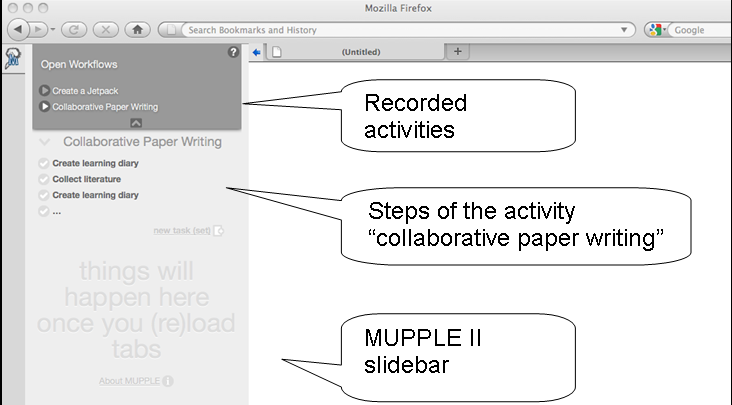 The MUPPLE concept encompasses a broader vision than implemented in the MUPPLE II Firefox Jetpack Extension. The core of MUPPLES (Mash-Up Personal Learning Environments) is the learner interaction scripting languages (LISL). LISL is a domain-oriented design language to specify actions, interactions with others, with artefacts and with tools. The semantic model behind MUPPLE describes the learning situation as activity consisting of actions, which refers to Objects and/or requires tools. Scripting learning activities: We see high potential to apply the LISL concepts within MUPPLE II using Mozilla Ubiquity. Mozilla Ubiquity also allows binding actions to objects and tools. It could serve as the foundation for a learner tailored domain specific language. Moreover, we believe that we could have a LISL implementation on top of the Ubiquity’s Parser 2 allowing for a tight integration between LISL and existing Ubiquity commands, as well as leveraging the localization possibilities of the parser. Collaboration: Another aspect of the MUPPLE concept is the strong notion of collaboration of learners. Collaboration implies sharing of data. Mozilla Weave could serve as the underlying database infrastructure for sharing data in a secure way. Note: check also further below the “Technical Notes & Further Work” on sharing workflows, interoperability with OpenAnnotation, RDFa, Ubiquity, etc. Scaffolding with navigational support (Shapiro, 2007) helps preventing learners from getting lost in hyperspace (Otter & Johnson 2000). Our proposed prototype aims to support learners with structure. MUPPLE II offers facilities to trace web activities – and ways to replay them. Complex tasks often involve many different web applications in a variety of concrete action steps to be undertaken in order to finish them. With MUPPLE II users can trace, share, and replay these steps with especially users who have little or no experience in using the involved tools yet. MUPPLE II helps users to develop rich professional competence by guiding step by step through best practices needed to achieve particular tasks. MUPPLE II is already the second prototype we have build: it bases on MUPPLE (Wild et al., 2008). Today not only institutions for formal education such as schools and universities but also most work places and vocational training providers are equipped with at least some kind of tools that bring together people and content artefacts in learning activities to support them in constructing and processing information and knowledge. With increased mobility, with exploding information offers, and light speed in technological innovation, building and maintaining these learning environments has not become easier. More: it has become the responsibility of the individual, rather than an institution. Supporting learners in building and maintaining their personal learning environment (PLE) therefore has drifted into the focus of attention in learning technology. MUPPLEs enable learners to capture, actively manage, and share good (best) learning practice. The core of MUPPLES (Mash-Up Personal Learning Environments) is the learner interaction scripting languages (LISL). LISL is a domain-oriented design language to specify actions, interactions with others, with artefacts and with tools. The semantic model behind MUPPLE describes the learning situation as activity consisting of actions, which refers to Objects and/or requires tools. Capturing learning activities in scripts makes the learning experiences hidden in them accessible — and helps with learning a better learning environment which will shape future learning experiences. It can additionally help with building up rich professional competences. In addition, it supports emergence of new practices, rather than prescribing. Practices like writing collaborative a research paper contains several steps, which have to follow a certain order, and involves the usage of several web tools. For each step of the process, learners have to get to know how to make use the provided tool. Help pages are often available, but often the learners only need a small portion of information to become productive. MUPPLE II includes this information directly into the web page. Instead of only providing navigational support through hyperlinks to text or multimedia, we extend the scope including web functionalities. The navigational support of this prototype will help learners to replay recorded practices and give them the information they will need to make use of the tools. Learners will be able to “follow in experts’ footsteps”, who defined and order the single activities for efficient practice. The two fundamental principles of MUPPLE II are capturing and replay of web activities. It provides a recording cockpit that accompanies you at the side of running through a learning activity you recurrently use. The recorder prompts you to explain certain steps in your web handling and to explicate the actions pursued. For example, when navigating to WordPress it allows you to record the action you are performing and with which intended outcome or goal. For example you can record that you are about to ‘register’ a new ‘learning diary’. This way, an activity script can be built from the recorded activity. The script captures action-outcome-tool statements binding the URL of a tool (function) to certain actions while explicating the intended outcomes such as goals, states, or artefacts. This script can be used to monitor subsequent workflows (and provide task list like workflow navigation). This script, however, can also be shared with others as a kind of activity pattern. Whenever necessary, the recorder provides depersonalisation facilities to remove usernames from URLs, replacing them with placeholders that prompt user input whenever instantiated. As many web applications today support simple in- and output formats, even more complex data processing and data travelling activities can be designed that make sure learning traces created in one application (e.g. literature search engine) make their way to the other (e.g. bookmark sharing service). MUPPLES are a matter of research on personal learning environments using mash-ups. They are actively investigated in the European Commission funded IST projects ‘iCamp’, ‘LTfLL’, and ‘ROLE’. iCamp is the specific, targeted research project that invented the idea of mash-up personal learning environments to support the adoption of social software in higher education. The project finished with the end of the year 2008. The project had eleven industrial and academic partners, and a budget of 3.4 M EUR. Language Technology for Lifelong Learning (LTfLL) is a specific targeted research project and deals with flexibilising the learning infrastructure and mixing in text mining technologies to support – say – medicine students in their learning. The project has eleven partners spread all over Europe. ROLE is a large integrated project that aims to provide an responsive open learning environment, involving several stakeholders mainly in Europe but also from partners all over the world (e.g. China, Canada, Australia). ROLE builds up on the idea of a personal learning environment, that opposed to virtual learning environments tailors its functionalities and practices to informal learning supporting life long learning. ROLE targets every person with building their network of experts to learn collaboratively in all sorts of fields. The tools and components as well as the personal learning environment will be openly available through the ROLE software repository. This will enable that interested persons can install their own ROLE instance to support their network of learners facing the challenges of the information age. Wild, F., Mödritscher, F. and Sigurdarson, S.: Designing for Change: Mash-Up Personal Learning Environments. eLearning Papers, 2008 9. http://www.elearningeuropa.info/files/media/media15972.pdf. Otter, M., and H. Johnson: Lost in hyperspace: metrics and mental models. Interacting with Computers, 2000, 13, no. 1 (September), pp. 1-40. Shapiro, A. M.: Hypermedia design as learner scaffolding. Educational Technology Research and Development, 2007, 56, no. 1 (11), pp. 29-44. The current [prototype code] is quite hard to follow, it has grown organically around various real and supposed limitations of Jetpack. We adapted some cross-site scripting style strategies in order to achieve a tight coordination between Jetpack and the code in the slidebar; therefore we use a hidden iframe (fed with data URIs) to communicate from the slidebat to jetpack (which listens for the load event), while from jetpack to slidebar or to any tab we inject script tags with raw code or JSONP. We use the Jetpack storage in a particular way: we store a large part of the slidebar’s DOM tree into the store instead of individual objects. The concept is that the slidebar it is not a mere View (as in MVC) of a Model, but the Model itself, directly manipulable. If someone drags and reorder some actions (DOM elements) there is no need for propagating those changes to an underlying granular database, no need to determine which individual records have to be updated in a consistent manner. This approach was inspired by the [Naked Objects pattern]. Since the slidebar is also the Model, we need to store things there which should not be revealed to the user (such as IDs, URIs, types). For this prototype we chose to use RDFa annotations. We will investigate if HTML5 microdata would bring us more benefits; we’re also thinking of the possibility of creating a workflow microformat. Having such a Model+View combo would allow for a very simple sharing strategy: you could just select and copy a workflow from the slidebar, and paste it in a blog post – all the underlying data would be just propagated and MUPPLE could just recognise in any web page published workflows and prompt the user to import them at will. Having RDFa annotations also allows us to serialise the Model to RDF and it would be possible to publish a workflow via a public RDF store (like the [Talis Platform]), this would allow MUPPLE to look-up existing workflows involving a site the user is browsing. Also, apart of the mentioned RDF approach, we hope that future versions of Mozilla Weave could enable various levels of collaboration. We consider each recordable action as an annotation, and we would like to have them compatible/interoperable at some level with [Open Annotation] initiative. We already use [xpointerlib] for note actions which would allow us to create [Annotea-like] annotations and be interoperable with Open Annotation. Xpointerlib proved quite useful in prototyping [recording] and [sharing] of Ubiquity commands; having them as recordable actions in MUPPLE could enable the creation of workflows based on an open market of Ubiquity commands and provide by this a straight forward way in extending MUPPLE functionality. Moreover, think of the possibilities that the sole command translate from Ubiquity could bring to MUPPLE: collaboration that spans language barriers. As we already mentioned, a LISL implementation on top of the Ubiquity’s Parser 2 might allow for a tight integration between LISL and existing Ubiquity commands, and it might leverage the localization possibilities of the parser if needed. Right now the prototype as UI is pretty much what we envisioned, but with partial functionality; this is mostly due not to the difficulties in added the envisioned functionality, but when observing, hands-on, that some activities must be separated, namely editing a workflow and “replaying” a workflow have to be distinct, as controls, as visual state communicated to the user; therefore we did not add extra functionality just for the sake of a prototype, we believe that a reboot of MUPPLE II is required, and we plan to do it in February. After learning how to fly a Jetpack we can now focus on core functionality, code clarity and unit testing. MUPPLE II is brought to you by the Knowledge Media Institute of the Open University, UK. The initial vision of the MUPPLE II Firefox Jetpack talks more about the motivation and introduces a use case to write collaboratively a paper using Web 2.0 webpages. March 14th 2010 saw the Mozilla Foundation’s “Jetpack for Learning Design Challenge” awards presented at the international South by South West interactive technology festival in Austin, Texas, USA. The international community of web learning project teams started work on Firefox prototypes in December 2009. The Jetpack for Learning Design Challenge sought international project ideas that could turn the open web into a rich social learning environment. The Jetpack SDK aims to help designers to build powerful Firefox add-ons and is part of Mozilla’s new Drumbeat initiative. In February, Mozilla announced that ten projects were selected as Design Challenge winners and invited to participate in a Mozilla Jetpack design camp. KMi was already a double winner in this work, as two of this international top ten were KMi Projects: MUPPLE-II and COHERE. Three of the top ten winning projects were also chosen for special awards: ClozeFox was selected as “best use case”; Expression Widgets was chosen as the “best web hack” and our own ROLE Mupple-II web recorder received the prize for “sharing knowledge with others”. The MUPPLE II system, which is now part of the EU ROLE project, implements an end-user friendly toolkit for learning environment design and best practice sharing. MUPPLE-II helps to record activities such as ‘getting to know each other’, share, and replay them. It combines the latest Web 2.0 semantic web technologies to enable personal and collaborative learning on the Web. Accepting the award on behalf of the KMi team in Texas, was Laurian Gridinoc. “Winning this Jetpack for Learning award is only the first of our of MUPPLE II milestones”, he joked. The MUPPLE-II implementation will be further developed as part of the Responsive and open learning environments ROLE, research work. In this EU FP7 funded research, ROLE will offer adaptivity and personalization in terms of content and navigation and the entire learning environment. Two teams from KMi participated in the ‘Jetpack for Learning Design’ challenge run by the Mozilla Foundation to revolutionize learning. And two teams from KMi made their way through to the finals. MUPPLE-II implements an end-user friendly toolkit for learning environment design and best practice sharing. MUPPLE-II helps to record activities such as ‘getting to know each other’, share, and replay them. COHERE implements facilities to collaboratively annotate the web, semantically link the annotations, and engage the user in online scholarly discussion. The finals culminate in a design camp organised from March 10-12 by the Foundation in Austin, Texas, preceding the South by SouthWest Interactive (SXSWi) Conference. After 38 international teams were selected in the previous round, the jury now filtered out the ten most competitive ones to go, meet face-to-face on their expenses. The KMi teams guided by Simon Buckingham Shum and Fridolin Wild are sending their lead developers Michelle Bachler and Laurian Gridinoc as representatives to the finals of the competition. Jetpack is the recently released flagship of the Mozilla labs that explores new ways to extend and personalize the web. The ‘Jetpack for Learning Design’ challenge is organised by the Mozilla Foundation with support from the MacArthur Foundation. Keeping track of the history of the mentoring sessions. 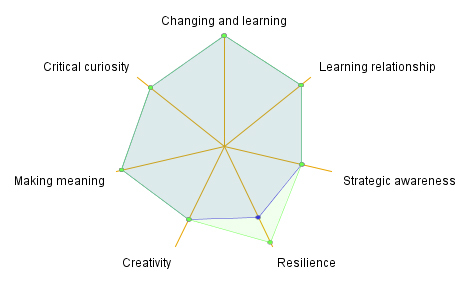 resilience – the readiness to persevere in the development of my own learning power. ELLIMent represents a learner’s self-report in term of these dimensions as a spider diagram, giving mentors and mentees the opportunity to reflect on it, choosing dimensions and interventions to work on, to develop learning power. changing and learning – a sense of myself as someone who learns and changes over time. critical curiosity – an orientation to want to ‘get beneath the surface’. meaning making – making connections and seeing that learning ‘matters to me’. creativity – risk-taking, playfulness, imagination and intuition. learning relationships – learning with and from others and also able to manage without them. strategic awareness – being aware of my thoughts, feelings and actions as a learner and able to use that awareness to manage learning processes. ELLIMent represents a learner’s self-report in term of these dimensionsas a spider diagram, giving mentors and mentees the opportunity to reflect on it, choosing dimensions and interventions to work on, to develop learning power. ELLIMent was built during a two-month part-time internship with the SocialLearn project of the Open University. The working name of the project was SERIT (SocialLearn ELLI Reflection and Intervention Tool), which was later renamed ELLIMent. Before the actual development work on ELLIMent started, several interviews with ELLI mentors helped to ground an understanding about the needs of mentors to support their mentoring work online. 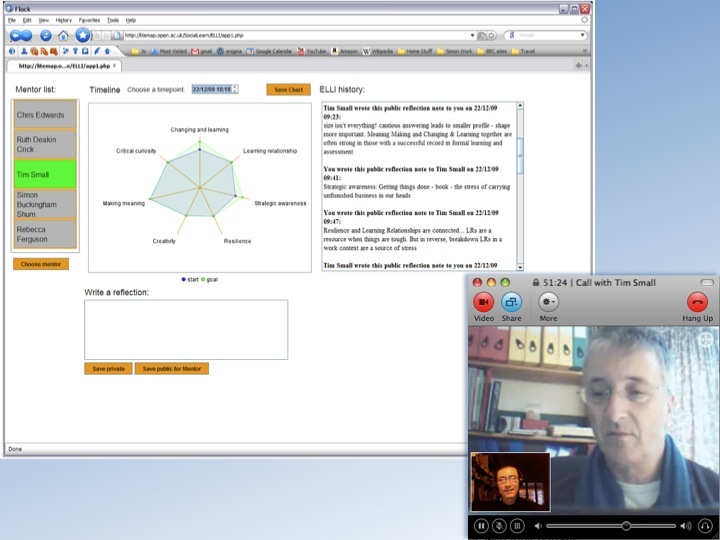 After the implementation, ELLIMent was demonstrated at a SocialLearn ELLI meeting in Bristol. ELLIMent is now used for ELLI mentoring sessions. This process is accompanied by an evaluation study on the usability of ELLIMent. This page will give you a detailed overview about the functionalities of ELLIMent. It addresses ELLIMent for mentors and for mentees. ELLIMent is your companion during the whole ELLI mentoring process. You can use it during the mentoring sessions, and even more after them. During an online session, Mentor and mentee could for example communicate with an online conferencing tool like FlashMeeting or Skype, while simultaneously using ELLIMent (the same applies for face-to-face meetings). Both, the mentor and the mentee have with ELLIMent the same view on the profile, which enables them to reflect about it. However, its real strength is seemed in the phases between mentoring sessions. Mentees and mentees can start ELLIMent wherever they are and whenever they like, to write up their reflections about progress they have made. In this sense, ELLIMent is a diary of the endeavour of developing life-long learning skills. Go to the login page of ELLIMent: Link to login page. Enter the data you received from the registration Email. ELLIMent starts to load (this could take about one minute, depending on your internet connection). If it is not loading, please see below the troubleshooting section. The first thing you would do is to select your mentor. On the left side of ELLIMent you can choose from the available mentors. Click on the name. The colour of the name will change. Then click on “Choose mentor”. The selected mentor will be highlighted in green. In the middle, you see your ELLI profile. You can expand each dimension of the profile to indicate to your mentor which dimension you want to discuss. Save your changes with the “Save Chart” button. You can browse through all changes by scrolling through the timeline above the profile. 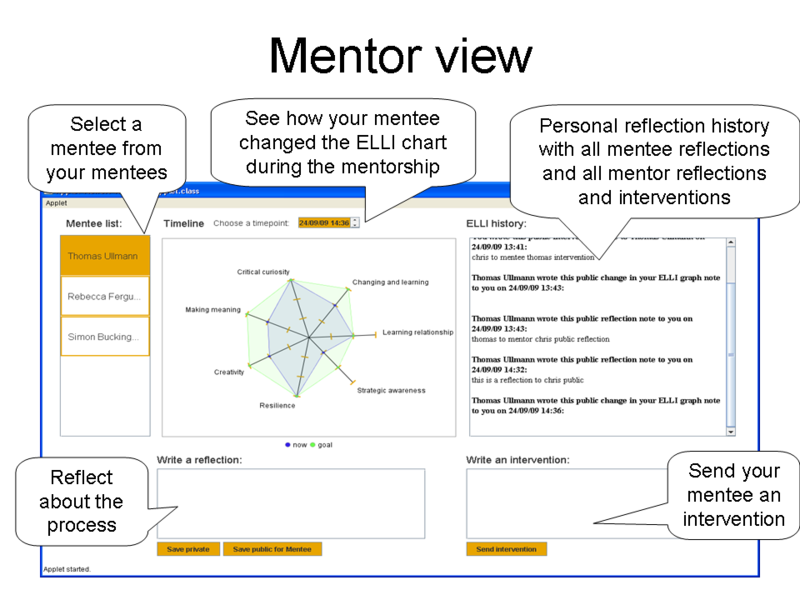 In the part under the profile, you can write your reflections about your mentoring process. You can save it either public or private. If you save it public, your mentor can see your reflection and reply to you. If you save it private, only you can see your reflection. 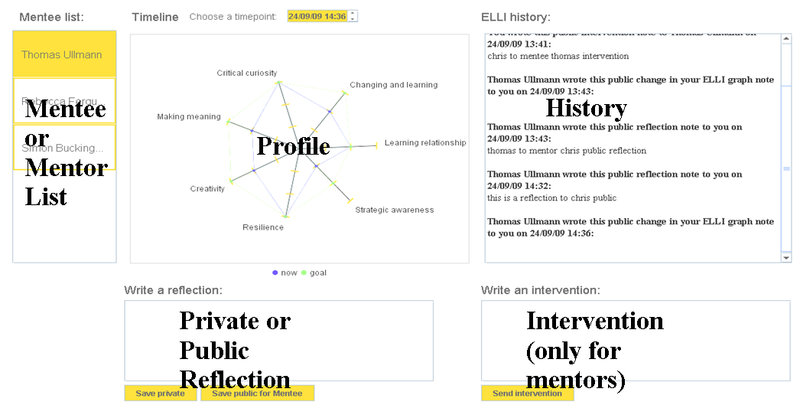 In the ELLI history on the right side you can keep track of all your reflections and you will see there interventions your mentor sent to you. On the left side of ELLIMent you can see the mentees assigned to you. If no single mentee has select you as mentor, the screen will be blank stating ‘No mentee assigned by now’. After a mentee has selected you as mentor you will see him/her in this list. You can click on their names to see the information they share with you. The selected mentee will be highlighted. In the middle, you see the ELLI profile of the mentee. You can browse through all changes of the mentees’ profile by scrolling through the timeline above the profile. This will help you to see what dimensions of the profile the mentee wants to change. In the part under the profile, you can write your reflections about the mentoring process. You can save it either public or private. If you save it public, your mentee can see your reflection and reply to you. If you save it private, only you can see your reflection. On the left bottom is a field where you can write interventions to your mentee. Use this field if you make your mentee a suggestion what he or she could do to engage more in the reflection process about lifelong learning skills. 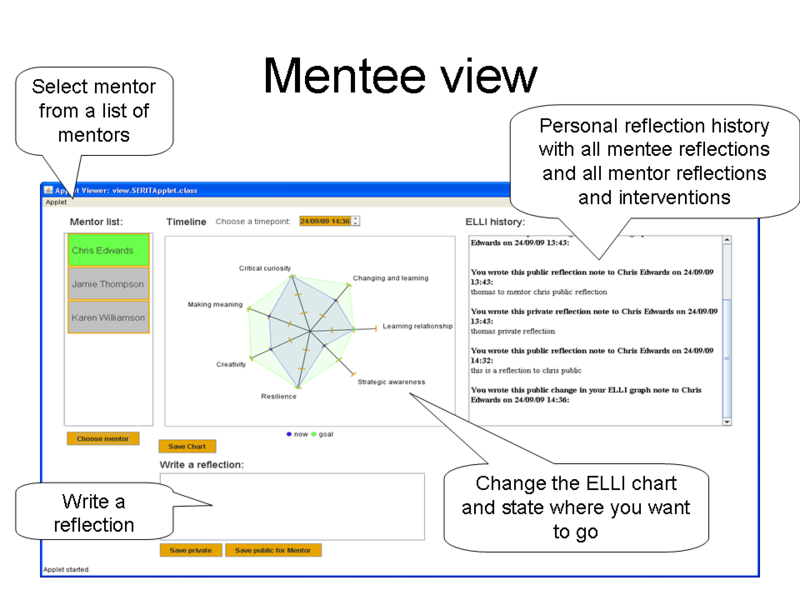 In the ELLI history on the right side, you can keep track of all your reflections and interventions and the “public” reflections of the mentee. In the picture above, you can see again the components of ELLIMent. The Mozilla foundation announced the winners of the first round of the “Jetpack for Learning Design Challenge” and two teams from KMi won through to the second phase. Jetpack is one of the Mozilla Labs new flagship projects to explore new ways to extend and personalize the Web. Together with the John D. and Catherine T. MacArthur Foundation the Mozilla foundation started the Jetpack for Learning Design Challenge to revolutionize learning. The MUPPLE and the COHERE concepts of KMi competed with 38 teams from all over the world in this challenge. The excited Jetpack jury stated that the contributions of the winning teams were of exceptional quality. Both KMi teams are now entitled to a six-week Jetpack tutorial that combines presentations by experts on design/UX aspects and the technical background to Firefox add-ons. At the end of phase two the Jetpack for Learning team will again select the most promising concepts and invite up to ten eligible participants to a face-to-face Jetpack for Learning Design Camp that will take place just before SXSW Interactive in Austin, Texas.